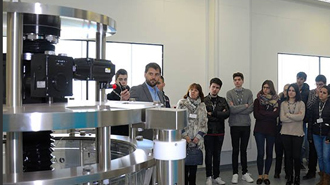 In February, the biotechnology company mAbxience, which specialises in the development of biosimilars, specifically monoclonal antibodies, invited close to a hundred students from the Universidad de León (ULE) and the Instituto IES La Bañeza, to its plant located in León’s Technological Park, with the intention of bringing its activities closer to young local talent. The visit of the students on the Biotechnology programme at the Universidad de León, which took place on 19 February, was also attended by Dr José Ignacio Rodríguez Barbosa, Coordinator of the Immunology Department at the University Institute of Biomedicine, as well as other professors. It also included a presentation from the director of the plant, Luisa Amoedo, followed by a guided tour around the plant’s facilities. During the visit, the ULE students, many of whom are also members of the León Association of Biotechnologists, had the chance to exchange ideas with some of the company’s employees. The company currently has around a dozen employees who were hired directly from the ULE. To this end, Luisa Amoedo, Director of the plant in León, assures that “at mAbxience we are aware that a committed and highly involved human team is a company’s most valuable asset. Having the best technology is important but the people who put it in place and use it are even more so. For us, it is a commitment to a long-term investment in talent”. As well as this, mAbxience also opened its doors to 50 pharmacy assistant and biotechnology students from the Instituto IES La Bañeza. This visit helped awaken in these students an interest in the activities of mAbxience, as well as reinforcing a link between the company and other local academic institutions. mAbxience supports keeping local talent and, as a consequence, maintains a strong commitment to fostering the training of professionals through a training programme which puts students from León in contact with the best professionals in the sector.